Tomorrow November 17 is Homemade Bread Day! And it is the big day, the drawing for the Bread Makes the Meal giveaway from Emile Henry. Don’t forget to visit their Facebook to enter. Just message them a favorite bread recipe. But before you go, no month-long frenzy of home baking would be complete without a recipe for Country Baguettes. In fact, the bread we make at home most often is this one, a long fermented dough mixed in the food processor using Charlie’s patented dough mixing method. The dough mixes in a snap, 45 seconds in fact, using a food processor fitted with the metal blade. Then it ferments for a good 2 to 3 hours before shaping, proofing and baking. Shaping baguette dough is rather simple but takes a little practice. Divide the dough into three uniform pieces. We use a scale to weigh each piece. Then form each piece of dough into a tight ball. 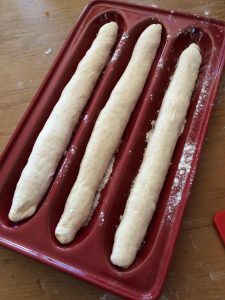 Let the dough sit and relax for 15 to 20 minutes before rolling out into the baguette shape. We like to taper the dough to give the country baguettes pointed ends. 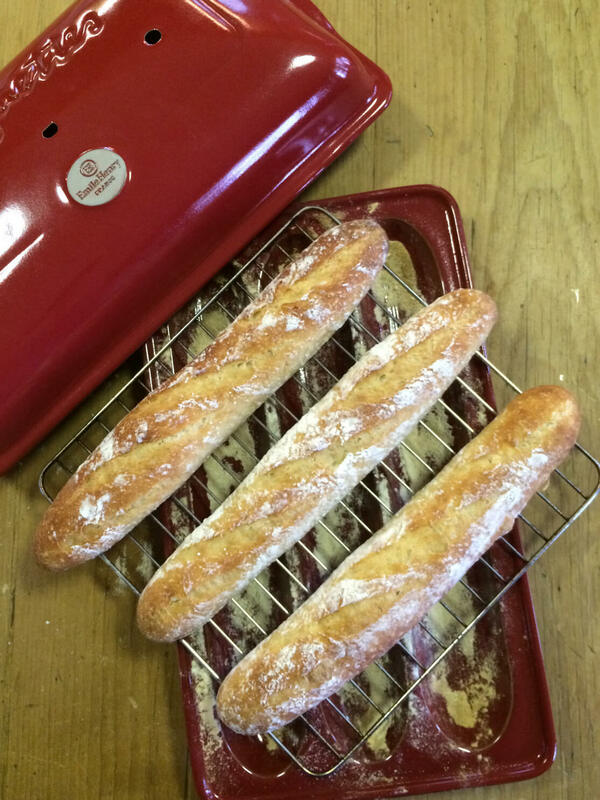 If you are using the Emile Henry Baguette mold, you need to sprinkle the cavities with a generous amount of flour. Over time the bread dough will resist sticking but the first few times you use the mold, it will need a good amount of flour. Place the dough into the cavities in the mold, cover and let it proof slowly before baking. If you don’t use a mold, lightly flour a parchment-lined half sheet pan. Place the rolled dough on the pan. And loosely cover the pan with a sheet of thick plastic. A clean trash can liner works well for this purpose. Cool your bread on a wire rack to preserve its crisp crust. Then slice and slather the baguettes with butter. A fresh baked loaf cries out for an accompaniment. 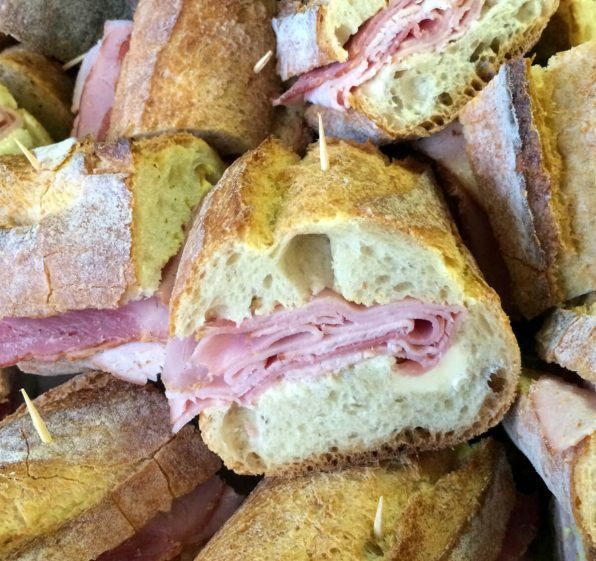 A French sandwich jambon – buttered baguette, sliced ham and mustard – knows no equal when made on this bread. A country baguette has a crisp crust and chewy crumb. It rises slowly in a cool environment where it develops a complex flavor. A fresh baked loaf cries out for an accompaniment. A French sandwich jambon - buttered baguette, sliced ham and mustard - knows no equal when made on this bread. Place dough in a large ungreased bowl, covered with plastic wrap. Ferment the dough 2 to 3 hours at room temperature. Use the dough immediately or refrigerate the dough, covered for 8 to 12 hours before using. Scrape dough onto a lightly floured work surface. 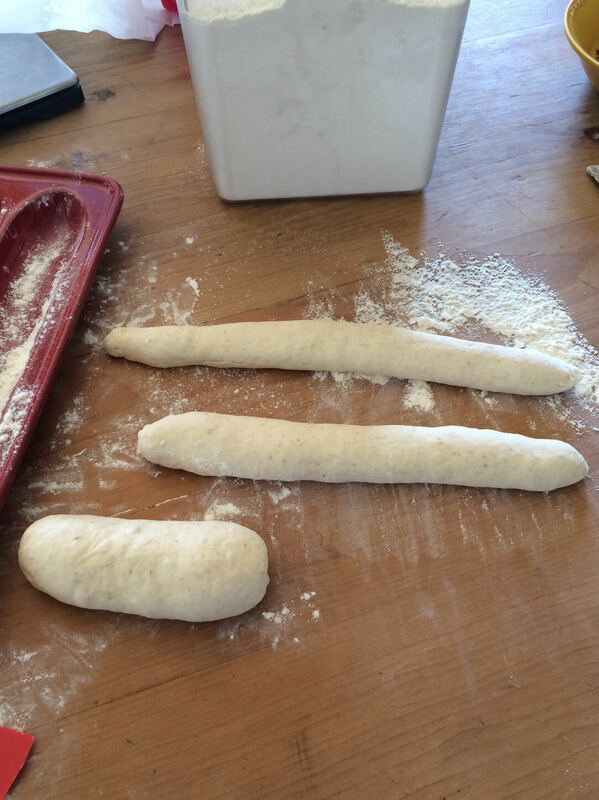 Divide the dough into 3 uniform pieces. Shape the dough into rough balls and let the dough rest, covered for 15 to 20 minutes. Roll out each piece of dough slightly longer than the length of the cavities in the mold. 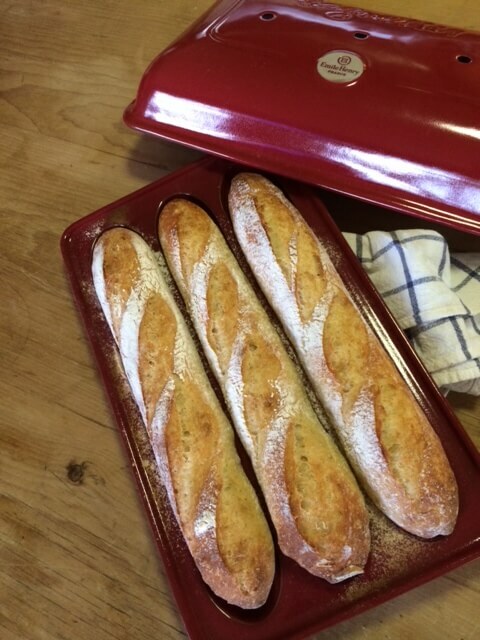 Dust the cavities in the Emile Henry Baguette Baker generously with flour. (Or line a baking sheet with parchment and sprinkle it with rice flour. *) Transfer the formed dough into the cavities in the mold or onto the baking sheet. Cover and let the dough proof until expanded 1 ½ times in size, from 30 minutes to an hour depending on the temperature of the dough and the temperature in your kitchen. Sift a light layer of flour over the dough if desired. Using a serrated knife, score the surface of the each loaf in three or four places. Cover and place on the center rack of the oven. Bake for 20 to 25 minutes. Carefully remove the lid and continue to bake the baguettes for 10 to 15 more minutes until golden brown and crackling. *If you are using a baking stone. Thirty minutes before baking, put the oven rack on the second shelf from the bottom of the oven and place a baking stone on the rack. Place a small pan for water on the floor of the oven and preheat it to 450°F. When the dough has proofed, pour ½ cup of boiling water into the pan placed on the bottom of your oven to create steam.